Back in July I wrote a piece that was published at Wattsupwiththat.com regarding the ocean acidification hypothesis (OA) and some of the issues I had with it. After reading the comments and more importantly reading a rebuttal I went through my equations sheet and found a few errors. Unfortunately life issues ate up a bunch of my time over the fall and winter. I have been lucky to have a break recently from tutoring and the onboarding process for one of the atomic laboratories is a bit slow so I had the time to finish this piece. I tried to push this project out a few months ago, however some grammatical errors resulted in a request for corrections, and I decided to do an entire rewrite. I chose to delay the submission because of a somewhat disconcerting conclusion I came to after reworking the equations and adding some of the peer reviewed studies. The findings are contained in the second section of the essay, but the synopsis is there is no real way to determine if the increase in atmospheric CO2 is mostly anthropogenic. The same equilibrium relationship that drives the doom and gloom predictions of rising atmospheric CO2, works in reverse if the pH drops below the atmospheric equilibrium value. This may be one of the strongest arguments against an industrial impact on atmospheric CO2 and for natural forces affecting atmospheric CO2. For large complex systems I typically use PTC’s MathCAD for its excellent ability to display equations in true math format, store variables and carry units. The GUI for this program is simply amazing. The original equation set that I used in the essay was generally correct, however it was developed to look at OA in response to a forum debate I was observing. Because I have yet to receive my big oil check (maybe it bounced), I developed the set as a back of the envelope calculation to evaluate, presented my results and let some of the engineers check my math. It turns out there were some errors they did not catch, so when I wrote this essay and reviewed the equation sheet, it was only a cursory glance, after all it had passed a “peer review”. Here’s what I found on a more thorough investigation. I mentioned the EPA value for change on ocean temperature as 1.5-1.75 C when in fact it was Fahrenheit. I assumed that all reputable agencies worked with SI units but I was wrong. Truthfully henry’s law constant corrections are not particularly necessary until you approach temperature variances of about 10C. This value was only researched and correction included because I saw a sceptic trying to claim the change in the henry’s law coefficient was what was responsible for changes in atmospheric CO2 concentrations, this is simply false the thermal variance is too small to significantly impact the direction of CO2 flux. The second issue I found was a complete user error. When entering the unit set I wanted for atmospheric pressure I was thinking in PSI, not sure why I just was, however in the equation I defined it as atmospheres. Thus the partial pressure of CO2 in my systems of equations was increased by a factor of about 15. When evaluating answers we have a general range of value we find acceptable. The multiplication factor produced a value of .001 for pH which was lower than expected but not so low as to automatically reject it. When the error was removed the calculated pH on my equation set fell to a change of about .0001 which is far too low to be reasonable. So what happened? In short I took a shortcut which is mathematically invalid. Below are the four main equilibrium equations regarding an aqueous system of CO2. The first equation is henry’s law which represents the equilibrium relationship between the partial pressure of CO2 and dissolved CO2 in water. The second equation describes the hydration equilibrium between dissolved CO2 and carbonic acid. The third equation describes the first dissociation constant of H2CO3 and bicarbonate. The last equation describes the relationship between carbonate and bicarbonate. They don’t look drastically different than the modified versions I was using in the original essay. The fundamental difference lies in the concentration of hydrogen atoms which is not visible in my original set. I was focused on the relationship between how concentrations of the carbonic substance influence the concentrations of the others. So I removed the hydrogen Ion concentration and inferred it from the change in in concentration of the respective dissociated Ions. I inadvertently set the value of my equilibrium equations to a hydrogen ion concentration of 1. To speak more plainly I didn’t realize I was performing my calculations in a system with an assumed pH of 0. I apologize for my mistake. The very heart of the issue, and the core of my skepticism with most climatological finger pointing is the lack of data. There are no preindustrial pH measurements (more on this later). Without pre-industrial pH or for that matter any one of the other chemical species we cannot easily determine the equilibrium concentrations of any of the ions. It is also feasible to find a reasonable approximation through some fairly tedious algebra, which I attempted, found a close approximation but likely missed a step in the 3-6 pages of mixed success and derivations. It resolves to a cubic function, from which a root can be found and a second set of equations solved. I will even set up the equations for those who want to play with them. If we assume the major contributor to hydrogen ion concentration is atmospheric CO2, and if all resultant ions are tied to this then for each H2CO3 that dissociates, the concentration of hydrogen will increased by a total value of x1 which is the same increase in HCO3 concentration. For each subsequent dissociation of HCO3 the concentration of CO3 and hydrogen ions will increase by a total of x2. Thus the total hydrogen will be equal to the initial value plus x1 and x2, x1 and x2 can be negative. The zeroes in the ion concentration designate an initial starting point and the t designates the target period to solve for, enjoy. That being said we can much more easily approximate a comparable solution by making one more assumption. If the first dissociation is the dominant factor in the production of hydrogen ions, which it is ka1=2.5*10-4and ka2=4.69*10-11, then we can assume that the x2 contribution to hydrogen ions is essentially 0. This gives us a beautiful quadratic which is very easily solved as seen in equation 7 and then 8. Under these conditions we can see the relative changes in concentration of the various ionic species. As more CO2 enters the system carbonic acid goes up, hydrogen ion concentration goes up and bicarbonate ions increase at the same rate. However referencing the carbonate ion concentration, as the relative change in hydrogen ions is much larger than the change in bicarbonate, thus carbonate levels will drop. For example if I doubled the concentration of hydrogen ions, the concentration of carbonate ions will necessarily drop by half to maintain the equilibrium. An increase in concentration of 1*10^-8.2 hydrogen ions is relatively larger than the same increase at a base concentration in the range of 1*10^-4. So what does this prove? Sadly nothing. This system of equations only describes sterile, filtered seawater in a flask and holds about the same significance on the results as spherical chickens in a vaccuum. 2. What is the model missing? Unfortunately there are a large number of factors which are simply not accounted for in a flask hypothesis. There is of course the change in relative concentrations of important chemical species from things like biological function, sequestration, or other natural phenomena. These factors mean the flask model only applies at the boundary layer, a hypothetical infinitely thin slice that represents the boundary between the oceans and the atmosphere. Phytoplankton will consume oceanic CO2 for photosynthesis. Other microscopic organisms will produce different compounds resulting from various metabolic pathways. Many of which can influence pH, such as ammonia, acetic acid, urea and uric acid or even CO2. Larger organisms such as fish are well known to produce ammonia which is exchanged through the gills. Microorganisms and their various proteins, fall to the bottom of the ocean as they die. Permanently sequestering some of the CO2 in various proteins and tissues. “[the] observed annual variability (~0.3 units) and diurnal variability (~0.1 units) in coastal ocean acidity are both similar in magnitude to long-term global ocean projections (~0.2 units) associated with increasing atmospheric CO”1. “Our observations confirm an annual mean variability in pH at CCE-1 of nearly 0.1, suggest an inter-annual variability of ~0.02 pH, and capture episodic change” and even went further in their abstract stating “The effect of Ocean Acidification (OA) on marine biota is quasi-predictable at best”2. Thus while the model depicting OA as a function of CO2 may be relatively accurate, in some sites the interannual variability exceeds predicted changes and most impact studies seem to neglect this. To be clear dramatic variability of the carbonate system endorses the OA theory and its purported negative impacts. There is however one more issue with the OA hypothesis, and it stems from the same equilibrium equations used for its validation. Up until this point we have proceeded with the assumption that atmospheric CO2 concentration is causing the changes in hydrogen ion concentration. However natural biological, geological, and chemical sources induce a far greater change in hydrogen ion concentration or pH on inter-annual timescales. An increase in hydrogen ion concentration, assuming a large enough carbonate source, will produce an increased equilibrium value for atmospheric CO2. This is not to say such factors invalidate the theory of OA or anthropogenic emissions, it simply means that they have not been investigated sufficiently to rule them out. 3. What about demonstrable harm? One of the other criticisms found in the rebuttal related to my statements regarding demonstration of harm. Specifically I stated that if they want to claim there is some sort of harm imposed by OA they need to perform an experiment, and they hadn’t. In the rebuttal there is a list of experiments theoretically showing harm as the result of increased CO2. I highly recommend reviewing them if you get a chance. I clearly should have clarified my statement. It’s not that no experiment regarding CO2 and OA had been performed, I had already gone through the abstracts of most of his citations, I took issue with their validity. I already addressed in the previous section inherent ecological variability, but there are far more problems with this series of studies than simple ecological variance. In this case they tested conditions at a pH of 8.1, 7.9 and 7.7 assuming a delta pH of -.2 and -.4. From their quote regarding the natural habitat of the species, again ignoring ecological variability, the lowest value they should have been testing is a pH of about 7.93.You cannot forcibly change the pH in a controlled system with a sensitive organism and claim significant results when the natural environment has variability that exceeds the control parameters for the experiment. Secondly in almost all cases the studies evaluated the organisms over a very short time span, typically 6-8 weeks. This is not the same as evaluating a stable colony, nor is it akin to studying the adaptability of a species to a change in conditions. For calcifiers the ability to regulate pH at the site of calcification is important to their ability to calcify. The time to ramp up synthesis of required compounds to maintain a high pH at calcification sites may exceed the period of study. While calcification rates may decrease this is not the same as shell dissolution as was alluded to in the NOAA video. Simply put you cannot take a system which neglects: temporal, generational, ecological and habitat based variables and apply those results, no matter how significant, to a system which does experience these effects. Like I mentioned before, there have been no studies performed which demonstrate harm from OA. Furthermore this ignores the fact that calcifiers originally evolved under very high pCO2 >6000ppm conditions. In the rebuttal this point was conceded with a response that adaptation and evolution to such rapidly changing conditions is not possible. While I could not find the referenced work. I would contend that it is factually incorrect. While the time necessary for the evolution of an entirely new species would likely exceed the period of time over which OA is going to occur, a response to the changing chemistry, which marine calcifiers already have to handle yearly variation is not unlikely. It is certainly not unprecedented. The finches of the Galapagos have been shown to alter beak sizing as a response to drought or competition. We also learned of the effect of cars on a species of swallow in southwestern Nebraska, influencing the length of their wings in less than 30 years8. There is of course the incidence of the bacteria, discovered in 1975 evolving a unique enzyme to digest nylon, which wasn’t invented until 1935. There is even evidence of fish size, change and reproductive maturity varying as a result of our fishing regulations. Frankly neither the pH range nor the time frame for OA seems to be outside natural variation. There is also ample evidence that more significant physiological changes can happen in shorter time frames. At the end of the day, before we get all hot and bothered by OA we need to sit back and acknowledge that the species in contention not only show a wider reaction range than is commonly presented, but that whatever their method for calcification is, they simply need to increase the metabolic rates, or the mean metabolic rate of the species through natural selection, to adapt to changing oceanic conditions. 4. Clearly There Must be Some Amazing Data Supporting the Hypothesis. In the first essay I mentioned several points of contentions with the OA hypothesis. I have addressed my core mistakes and gone into the details and quibbles I have with the rebuttal. But there was one point I made in the original essay which was never touched on in the rebuttal. There is almost no data backing up the OA hypothesis. An engineer showed me that graphic during a debate over the summer regarding CO2 and OA. I love it, it’s a beautiful graphic, and it is entirely farcical. Luckily the tag on Wikipedia mentions that it is the estimated sea change. Unfortunately most people don’t understand the difference between a calculated value and a measured one as demonstrated by the first table on the Wikipedia page for ocean acidification. Note the field result stated next to pre-industrial levels, luckily this has been amended to reflect this is not in the citation given. To really understand how strong of an argument there is for OA we have to look at the data. 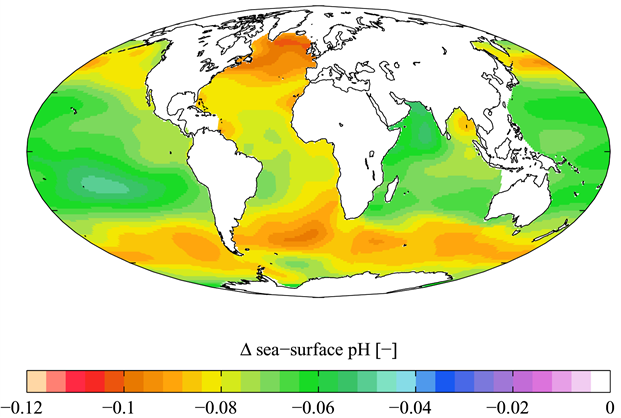 The very first worldwide composite of pH data for the oceans came from the GLODAP project. The goal was to establish a climatology for the world’s oceans. This is not an easy endeavor and I do respect the attempt but the result is frankly untrustworthy. While it did define an oceanic pH value in the 1990’s it did so with some gaping holes in its analysis. More specifically the entire purpose of the analysis was to estimate the amount of stored anthropogenic carbon. They estimate the uncertainty on this value to be 16% of the total inventory. The core of my skepticism in AGW and more specifically the catastrophic elements is always questionable data. This is no different for ocean acidification and the purported claims. After finishing my research and corrections, I was certainly able to corroborate the numerical consensus regarding pH changes as a function of CO2 concentration. However the correction did little to curb my skepticism of an anthropogenic ocean acidification hypothesis and the purported harms. There are simply too many false assumptions required for the idea to play out through its mathematical model. The same problems arise between small and large ballistics modeling. For lower speeds and shorter distances it is easy to neglect air resistance and get an approximate answer. But for longer distances or higher velocities we end up having to take into account air resistance. The current approach to modeling OA and organism adaptability is akin to trying to understand flight while neglecting lift and concluding it is impossible. There is direct contrarian evidence to the idea that marine pH is dependent on CO2. pH changes regularly in the ocean, to a greater magnitude than the anticipated effect of CO2 and in a shorter period of time. The ability of an organism to adapt to changing conditions is a huge variable between species, and the ability to adapt over a period of time has not been studied. Beyond these factors there simply has not been a solid organized long term study of oceanic pH to validate any of the claims. As is frequent in climate science we see gorgeous model visualizations rather than actual data, and we see claims rather than facts. Outside of these significant factors there is another aspect of OA which frankly needs more research. The fact that pH changes in response to biological activity, begs the question whether humankind is fully to blame for the increase in atmospheric CO2. Any factor that increases the activity of marine life, must necessarily increase the rate of flux of marine CO2 into the atmosphere. 3. Joint, Ian, Scott C. Doney, and David M. Karl. “Will Ocean Acidification Affect Marine Microbes?” The ISME Journal (2010): n. pag. Print. 4. Calleja, Maria Ll., Carlos M. Duarte, Marta Álvarez, Raquel Vaquer-Sunyer, Susana Agustí, and Gerhard J. Hernd. “Prevalence of Strong Vertical CO2 and O2 Variability in the Top Meters of the Ocean.” Global Biogeochemical Cycles 27.3 (2013): 941-49. Print. 5. Dupont, S., J. Havenhand, W. Thorndyke, L. Peck, and M. Thorndyke. “Near-future Level of CO2-driven Ocean Acidification Radically Affects Larval Survival and Development in the Brittlestar Ophiothrix Fragilis.” Marine Ecology Progress Series 373 (2008): 285-94. Print. 6. Ries, J. B., A. L. Cohen, and D. C. McCorkle. “Marine Calcifiers Exhibit Mixed Responses to CO2-induced Ocean Acidification.” Geology 37.12 (2009): 1131-134. Print. 7.Grant, Peter R., and Rosemary Grant. “Unpredictable Evolution in a 30-Year Study of Darwin’s Finches.” Science 296.5568 (2002): 707-11. Print. 8. Brown, Charles R., and Mary B. Brown. “Where Has All The Roadkill Gone.” Current Biology 23.6 (2013): 233-34. Print.